I should have written about this one before. A quick web search revealed to me only one astrologer who has, at least in a freely-available internet format. I will not be as verbose as this seemingly lone writer, but will spew my usual staccato barrage of data-points for the attention-span-challenged. Of whom I am one. Now that a recent court ruling declares some of the Patriot-Act-authorized spying to be illegal, the recent expiration of some of the related clauses makes the Patriot Act a timely subject. Despite Rand Paul's heroic blocking of the Senate vote which would have re-authorized domestic spying, re-authorization through the "USA Freedom Act" is inevitable. And, of course, our overlords rarely let something as paltry as legal authorization get in the way of something they want. Anyone with half a brain knows that the Patriot Act is bad news. This, therefore, tells us about the IQ of most of our overlords in Washington DC. It also calls into question whether our top-down system of government serves us anywhere near as much as it oppresses us. The astrology for the Act is, accordingly, stunningly horrible using the "Libertarian Astrology" analysis methods. Authoritarian: Pallas conjunct Pluto and South Node, ruled by Jupiter which is quincunx Pluto. Pluto is quindecile the North Node, increasing his power. Very weak on the ethical/libertarian side; extremely strong on the authoritarian/anti-ethical side. Capitalist: None or Venus "squine" North Node. The anti-capitalist signature is consistent with disregard for private property. 4. Jupiter, co-ruler of Moon, quincunx Pluto. 5. Sun novile and exactly parallel Pluto. Pluto in Sagittarius on the Ascendant: power over communications, in your face. Pluto opposite Saturn on the Descendant: power against foreign authority? Pluto quincunx Jupiter in Cancer in the Eighth: said power overwhelms any quaint ideas you might have about privacy in your own home. Sun in the Eleventh square Neptune/Mars conjunction in the Second: power over the masses via secret actions in the realm of private property. Mars/Neptune quincunx Saturn on the Descendant: extending secret activities against foreign authorities. Sorry, Merkel. Mars/Ascendant parallel contraparallel Jupiter: fighting the public. "Thor's Hammer" sesqui-yod with Mercury/Venus and Jupiter against Moon in the Third: money and the mass-communications apparatus versus any impression you might have that your speech is safe in your home. 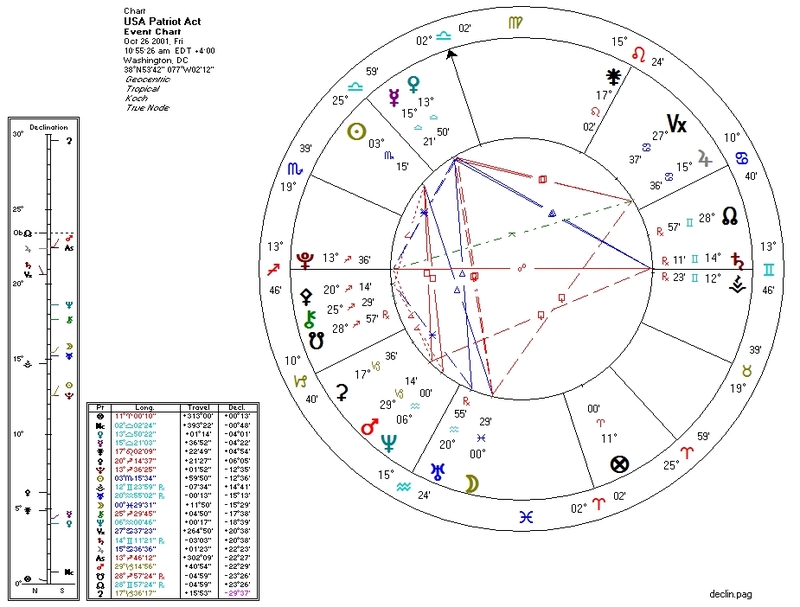 Uranus in Aquarius in the Third conjunct/parallel Moon in Pisces and trine Mercury: technology applied to communications, disrupting your private home life. To any idiots who think Rand Paul's brave stunt harms "national security": fear not. Leviathan will resume listening in to your conversations shortly.